Do Extraverts Make Better Sales People? I’m an extrovert at the higher end of the scale based on the Myer-Briggs Temperament Indicator. So what does that mean? It means the more people the merrier. Speaking in front of a large group – yes! Being at a party – yes! Really, the more people I get to be around, the more excited I get. The definition of an extrovert is; someone that gains energy in a crowd, which is me to a T! How do you feel around extroverts? Other extroverts love it. Introverts might be a little overwhelmed. Daniel Pink’s bestselling book- To Sell is Human, discusses how well extroverts and introverts do when it comes to selling. Since extroverts are more outgoing and typically more aggressive you would think they would do much better than introverts. They actually do sell better than introverts but only by a few percentage points. Extroverts might be surprised by the slight difference. If you look at the approach of each of these there is a stark difference how they interact with customers. Extroverts are geared towards “responding” according to Daniel Pink. This means that an extrovert would prefer to do the talking. That’s me and sometimes I hate it because the more I talk, the less I find out about the customer. Introverts on the other hand tend to “inspect”, meaning that they prefer to ask questions and put more focus on the customer. Extroverts like the highlight to be on them. Extroverts tell, introverts ask. In a sales conversation the rule of thumb is that the customer should do the majority (60-70%) of the talking. Since introverts ask questions they would have no problem getting the customer to do most of the talking. Not so with the extrovert. There needs to be a good balance between the sales person and the customer and it needs to be a natural flow. You don’t want either a long drawn out presentation by the extrovert and or an interrogation by the introvert. Pink mentions that the ability to move customers hinges less on problem solving and more on problem finding. In other words we should not be selling the product but the insight the product provides! The best sales people don’t access information; today they must be skilled at curating information by asking questions and uncovering possibilities. Pink believes that the best sales people are actually what you call “ambiverts”. These are people that actually fall in between the introvert and extrovert. They have the ability to respond when needed and to ask questions when appropriate. Ambiverts do significantly better with their sales results. How do you approach customers and prospects? When you meet a customer for the first time the best question to can ask yourself is “who am I dealing with”? What is their personality style? 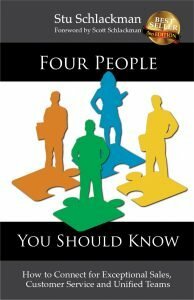 In my Four People You Should Know model that means, are you a Blue, Green, Gold or Orange. Once you ask this question you shift your focus off of your personality style and you’re now focused on the customer. Do they like to talk or ask questions? Are they formal or casual? Methodical or random in their approach? Engaging in small talk or not? Once you have a sense of their style, you need to behave in a manner that supports their personality. This builds strong rapport and gets them to open up. Ambiverts are the best at adapting to the customers style. On your next call, take yourself out of your style and be flexible and adaptable to your customers’ style. Join our mailing list to receive the latest news from Stu Schlackman. © 2019 Stu Schlackman All Rights Reserved. Join our mailing list to receive the latest news from Stu Schlackman, then take our unique color-coded personality assessment.